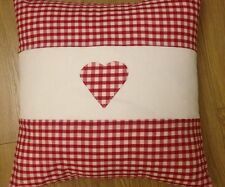 New HandMade Vintage Red ❤️ Gingham Heart Aplique Scatter Cushion Cover 16"
One Handmade Red gingham applique heart cushion cover 16"x16". Care instructions: hand or machine wash @30. enveloped backed in white cotton fabric. 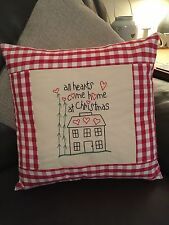 H andmade 16" Christmas Cushion Cover. Cream Envelope Enclosure to Back. LARGE GINGHAM CHECK PATTERN IN RED. 3 HABITAT CUSHION COVERS. Attractive large gingham check pattern in red & white. By Habitat. 3 classic design quality cushion covers. Cushion covers only. 100% Cotton. Set of 4 matching cushion covers. Hand or Machine washable on 30. 100% Cotton. Gingham Rose design in Rose by Kirstie Allsopp. Matches the Gingham rose bedding set by Kirstie Allsopp. Machine Wash 40C. 100% cotton cover. Approx 45 cm x 45 cm square with envelope opening on the back. 4 patchwork squares of white polka dots on pink background, first border is pale pink fabric and outer border is pink floral patterned fabric border, backing to cover is pink gingham fabric. Patchwork has been lined with a pale pink cotton fabric and a matching zip. Fabric used is prestigious textiles 100% cotton on both sides and felt for the teddy bears, features easy envelope opening and 3 button fastening. All fabric and felt has been shrink and colour tested. 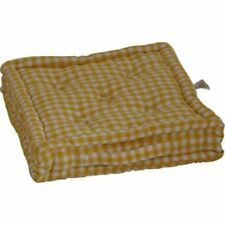 This cushion cover is handmade from a yellow cotton with a padded appliqued white daisies gingham heart. 1 xHand-crafted Cushion Cover by Kakia Designs UK. Cushion cover only- infill not included . Cushion cover only- infill not included . Machine Washable upto 40c degrees wash. 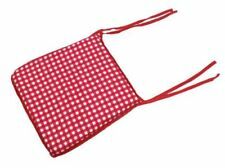 Type: Cushion CoverMaterial: 100% CottonSize: 16x16"
This apron has been made from 100% cotton. From a blue background with white stars, to a polka dot design and finally a blue and white gingham design, this eye-catching design has been finished with a lace edge at the top of the apron. Two are a blue and white stripe, one is a blue and white gingham check. Designers Guild Gingham fabric in Aqua/White made into a cushion cover. Size 18" x 18", shown fitted to 20" cushion pad, not supplied. 12 patchwork squares, which is 6 x white polka dots on pink background and 6 x pink butterfly pattern on white background. Border has a pink and white stripe pattern, cover backing is Rosehip pink/red with matching zip. This cushion cover has been made from 100% cotton. On one side is a white star design on a beige background, while the other has a white and beige gingham design. The cushion cover has been perfectly finished with a polka dot piped edge. BEAUTIFUL SHABBY CHIC PATCHWORK STYLE. Cream cotton calico envelope backing for easy removal. print and/or embroidery or applique. 100% Cotton 16" Cushion Cover. Quality 100% cotton cushion cover. CUSHION COVER. Purple Gingham Check with Hearts Cushion Cover Size 16" x 16"
This hand-crafted cushion cover is made from a purple and white gingham check cotton, with two padded appliqued purple hearts. 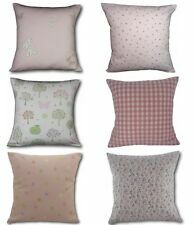 1 x Cushion cover only- infill not included. Cushion cover only- infill not included . Purple Gingham Check with Heart Cushion Cover Size 16" x 16"
This hand-crafted cushion cover is made from a purple and white gingham check cotton, with a padded appliqued purple heart. 1 x Cushion cover only- infill not included. Cushion cover only- infill not included . An original, one off cushion, unique, professionally crafted to a high degree. Laura Ashley Handmade Children`s cushion cover Pink Hearts/Gingham 16x12"
Fabric is Laura Ashley cotton pink hearts to front and pink gingham to back with envelope opening. Size is 16x12" approx. Handmade cushion cover (insert not included but seen here with 40x30cm feather pad). Lime Green Gingham with spotty Hearts Cushion Cover Shabby Chic 16" x 16"
Ulster Weavers blue and cream gingham cushion with Bay Tree Cats illustration by Bob Bowdige. 16" x 12" cushion in cotton cover fastened with buttons covered in matching gingham fabric. This illustration is titled 'Peeping Tom'. 1 x Cushion Cover by Kakia Designs UK. Cushion cover only- infill not included . Machine Washable at 40 degrees wash.
3 squares by 3 squares lilac/iris gingham with iris backing cushion cover 1 of 2. Pink Gingham Floral Heart Shabby Chic CottonCushion Cover Size 16" x 16"
This cushion cover is made from a woven pink and white gingham cotton with a padded appliqued pink floral heart. Machine Washable at 40 degrees wash. 1 x Handmade Cushion Cover by Kakia Designs UK. Laura Ashley. 2 X Large Cushion Covers. Checks in Multi beautiful shades of dusky pinks ~ Yellowy Orange~ Cream. Used Once but colours don't suit our decor. Very Good Condition. Lilac / iris gingham cushion cover. zipper is in the middle of the back and is cream in colour. 4 patchwork triangles of pink polka dots on white background, first border is pink gingham and outer border is pink and white stripe fabric border, backing to cover is Rosehip pink/red fabric. Patchwork has been lined with a pale pink cotton fabric and a matching zip. Lilac/iris Gingham with iris backing cushion cover 1 of 2. New HandMade Vintage Green Gingham Heart Aplique Scatter Cushion Cover 16"
One Handmade green gingham heart applique cushion cover 16"x16". Care instructions: hand or machine wash @30. enveloped backed in white cotton fabric. This cushion cover is made from a navy blue cotton, with a padded appliqued navy blue gingham heart. 1 x Handmade Cushion Cover by Kakia Designs UK. Cushion cover only- infill not included . Machine Washable at 40 degrees wash. This cushion cover has been made from 100% cotton. On one side is a white star design on a blue background, while the other has a white and blue gingham design. The cushion cover has been perfectly finished with a polka dot piped edge. New HandMade Vintage Black Gingham Heart Aplique Scatter Cushion Cover 16"
One Handmade black & white gingham heart applique cushion cover 16"x16". Care instructions: hand or machine wash @30. enveloped backed in white cotton fabric. 2 patchwork squares of pink polka dots on white background with 2 patchwork squares of pink butterflies, first border is pink gingham and outer border is pink and white stripe fabric border, backing to cover is Rosehip pink/red fabric. Pair Mr Fox Marine / Grey Cushion Covers - Piped In Marine Gingham - 12" X 12"
Pair Mr Fox Marine / Grey Cushion Covers - Piped In Marine Gingham - Backed In Grey. The covers have been piped in smale scale gingham which has been cut on the bias to add interest. Great fun design cushion covers - in bold Marine blue with Mr Fox in pale dove grey. Lilac / iris gingham with iris backing cushion cover. Laura Ashley Handmade Children`s cushion cover Pink Hearts/Gingham 14x14"
Size is 14x14" approx. Fabric is Laura Ashley cotton pink hearts to front and pink gingham to back with envelope opening. Handmade cushion cover (insert not included but seen here with 35x35cm feather pad). Threshold Toss Pillow Monarch Orange Lumbar Support Gingham Pattern 12" x 18"